You are currently browsing the tag archive for the ‘Santa Fe Trail Jewelry’ tag. 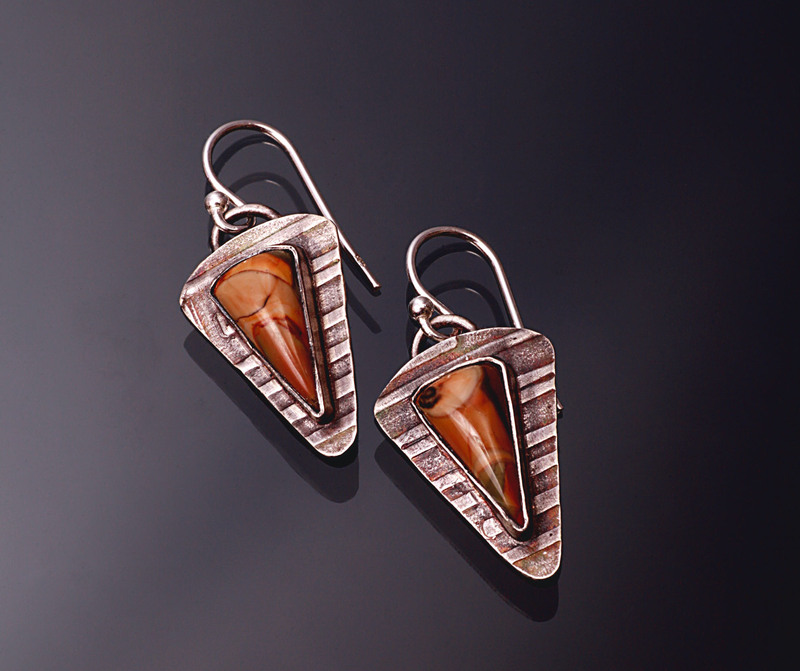 Do you enjoy Trunk Shows? I am curious. How many of you go to Trunk Shows? And of those who do, what do you think of them? My goal, when I have a trunk show is to present my latest works. I want to give clients a chance to be the first to choose from new creations. I am always striving to create those unique forms of personal adornment that allow the wearer to express their individuality. 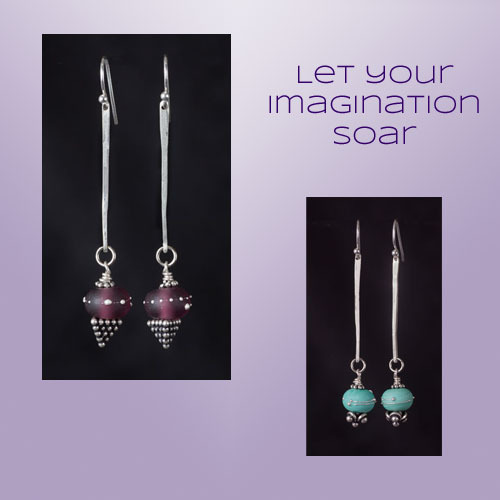 Textured Sterling Silver Earrings with gypsy set faceted Rhodolites. 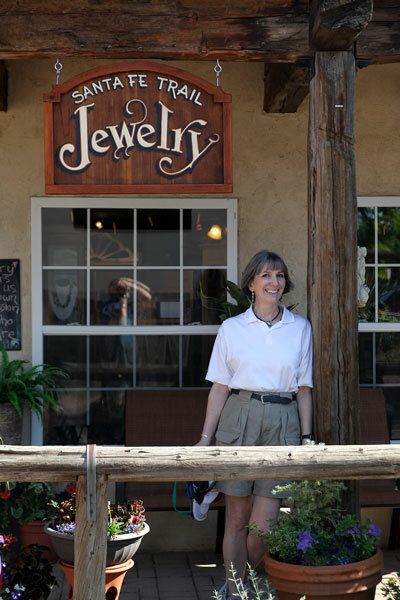 Marylee Reisig is the owner of Santa Fe Trail Jewelry. She works very hard to create the wonderful atmosphere that is ‘The Trail‘, which embodies her creative soul and love of the arts. She has represented me for years and this trunk show has become an annual event for us. Her support is invaluable and she truly cares about the artists, their work and her clientele. She’s continually growing what is available in her unique space and her warmth permeates this great location in Historic Downtown Monument Colorado. Back to my earlier questions. If you have never attended a Trunk Show, I would encourage you to do so. It gives you an opportunity to visit with the artist that has put their heart and soul into their designs and work. If you live in the area, please visit Marylee and me during this event. 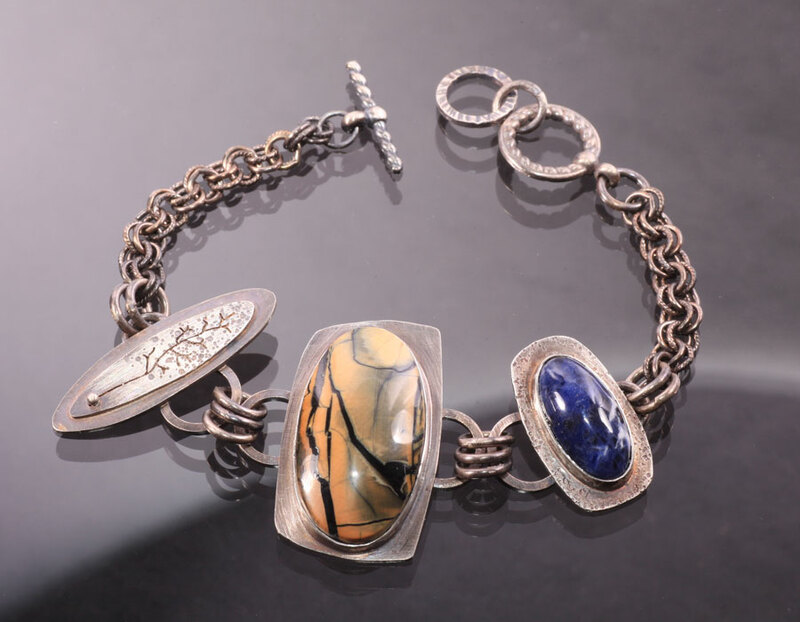 If you can’t make the date, I would encourage you to visit Santa Fe Trail Jewelry to enjoy the experience and look for that one of a kind work of art. 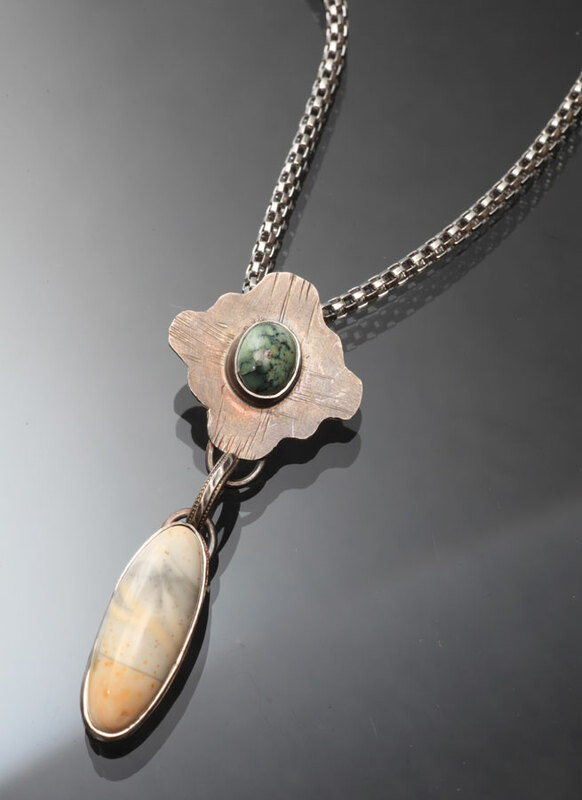 Marylee Reisig, owner of Santa Fe Trail Jewelry, will be hosting my Mother’s Day Trunk Show. This is one of my favorite venues. 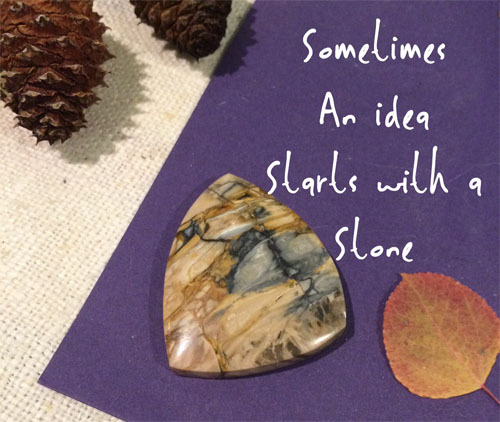 This beautiful stone became the inspiration for one of my cuffs. Hopefully I have peaked your curiosity because the cuff will debut at the show tomorrow. Recently I discovered a New Zealand glass artist, Lesley McIver. I just fell in love with her take on sea glass with traces of silver. 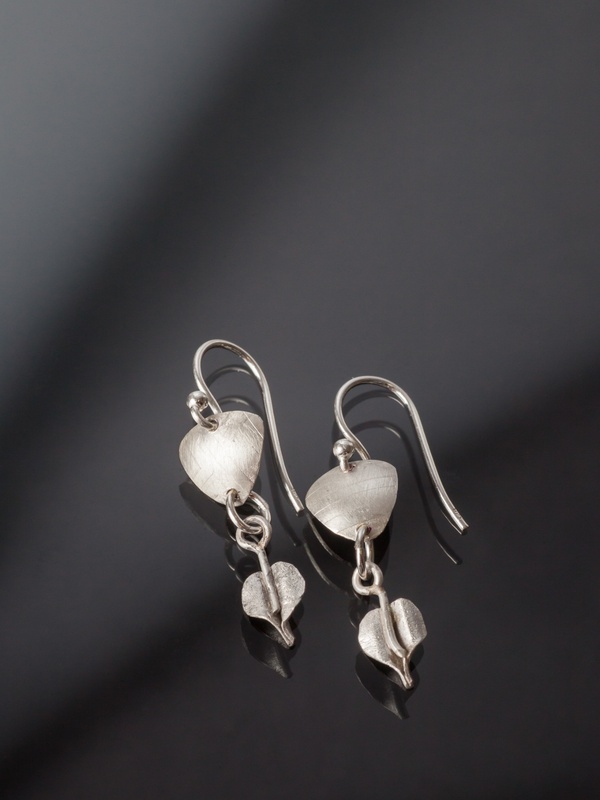 I’ve incorporated her work in mine to make these simple, yet elegant earrings. I will have a nice variety in different colors and shapes. There will be plenty of Treescapes. Enjoy the freedom to Express Yourself with some of these. Lots of possibilities for that special person in your life and maybe even for you! I hope you can attend. If you are unable to make the show and see something here that interests you, please inquire via email. This coming Saturday, February 7, 2015 will be my first trunk show of the new year. I am very excited to be debuting some new works, including some Treescape pendents like the one pictured here. The timing is perfect for Valentine’s Day shopping and I have some new earrings that you may find perfect for yourself or gift giving! I have so much fun spending the day with Marylee Reisig owner of Santa Fe Trail Jewelry. In between our conversations with customers, we spend time reflecting on our respective art work. There’s great energy at The Trail and so many beautiful things. I hope you will join us. Discuss a little bit about art. And maybe find something that calls to you. It’s that time of year again. 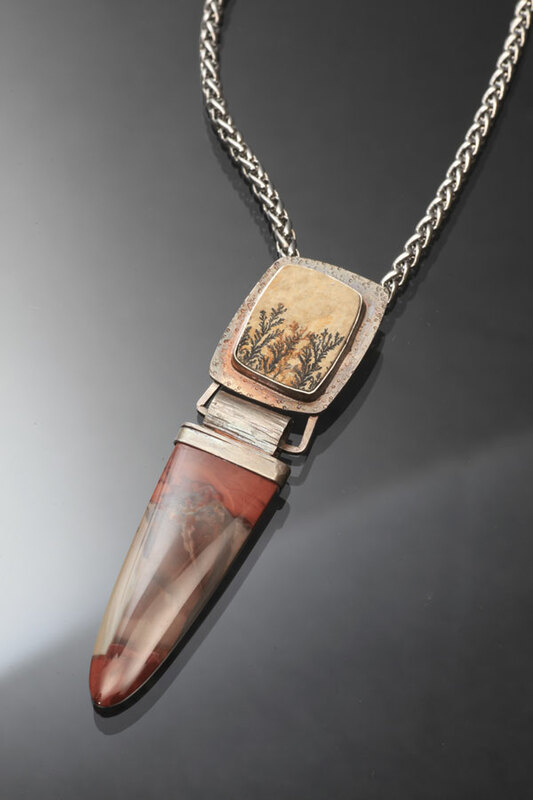 This Thursday, May 15th, is the official start of the Art Hop season in Monument, CO. For the next 5 months, on the third Thursday of the month, the merchants in historic downtown Monument will have their shops open from 5:00 PM – 8:00 PM. There’s even a new winery opening this week, Catriona’s, which I think will be very interesting to visit and enjoy their cafe, along with a tasting room. I will be at my favorite hang out, Santa Fe Trail Jewelry, with my latest works. 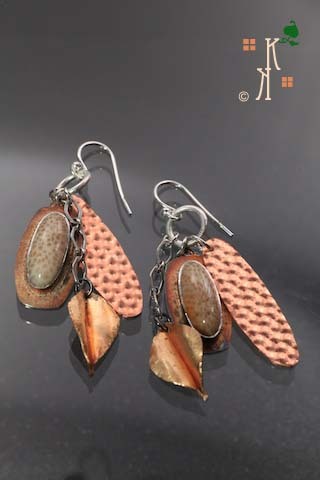 The earrings shown below are from my Sensory Delights series. A sweet, light weight pair that remind me of a Pharaoh’s head dress. It certainly is a fun evening. So much going on, so many places to see and people having a great time. Lots of artists are in attendance and we all love talking about what we do as we create our works. Once again, Marylee Reisig will be hosting my Holiday Trunk Show at her beautiful gallery as part of Small Business Saturday. I think you will find Santa Fe Trail Jewelry is a delightful setting for your holiday shopping. I will have my latest works available and it is my hope that you will find something that speaks to you as you search for that special gift. Rumor has it that there will be some delicious munchies, along with tasty spiced cider and other warm beverages for you to enjoy as you shop. I have been busy creating new works for this trunk show and would like to give you a preview of some of the items that will be available. Every once and a while, Dan comes up with some ideas and suggestions for me to try with my work. This year he asked, “What if you just do a metal pendant, no stone?”. I thought about it for Treescapes. The next two pictures show how I used a metal only component in a bracelet and a pendant. Since many of my Treescapes are asymmetrical, I thought adding the metal component to the side rather than the center would provide a more intriguing look for this bracelet. The center piece is not a stone, but actually Walrus tusk, which my friend, Jerry McClure introduced me to over a year ago. I love this material for what it symbolizes about the past, along with the beautifully rich colors and patterns. Jerry also cut this cab for me. The blue cabochon is Lapis, which I have not used that much, but Gary B. Wilson had a few of these that spoke to me this fall at the Denver Gem & Mineral Show. I added an extra jump ring to allow for some variation in how this will fit different sized wrists. This is just a very simple Treescape pendant. Since most of my Treescape earrings are just metal, it seemed like it would be a perfect companion if someone wants a matched set. My thanks to Dan for his support and the suggestions to experiment. I like the direction these subtle changes take Treescapes. Next is a pair of my Express Yourself earrings. I’ve been working more on the leaves, adding stems and having them take on a more organic look with the spirals. 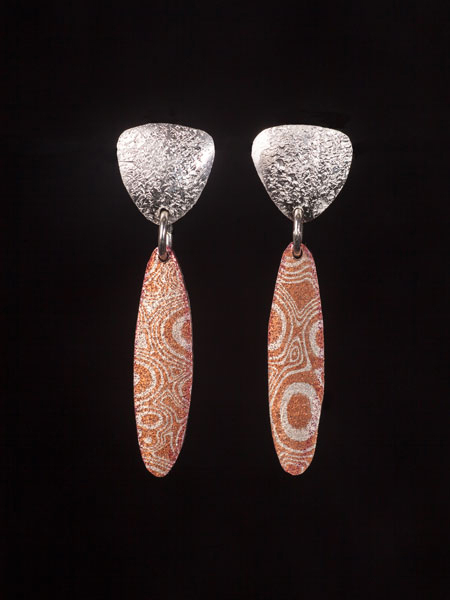 I’m fascinated with reticulated silver, so I am using it in a few of these earrings as I like the texture. 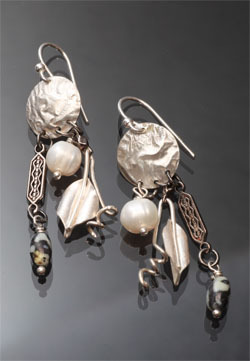 This pair has some slight asymmetry with the way I have arranged the pearls, leaves, and white buffalo turquoise. They are light weight and have that classic black and white color scheme that makes them perfect for wearing with just about everything! Soul Searching was one of my first series. So many of the pieces had a special meaning for me as I reflected about my life. Now I have decided to revisit this series with more of a spiritual aspect. My goal is to have a given piece resonate with someone and provide strength and encouragement. This particular bracelet is acid etched sterling silver that I have oxidized. I have applied a light matte lacquer coating to preserve the oxidation. The stone is Mookite. I see a distant mountain in this stone with the glow of a beautiful sunset in the background. As I viewed this finished piece, I felt a sense of calm and that is how it came to be called ‘Serenity‘. As I was going through my available stones, I ran across these lovely oval shaped Chinese Writing stones, acquired from Gary B Wilson. 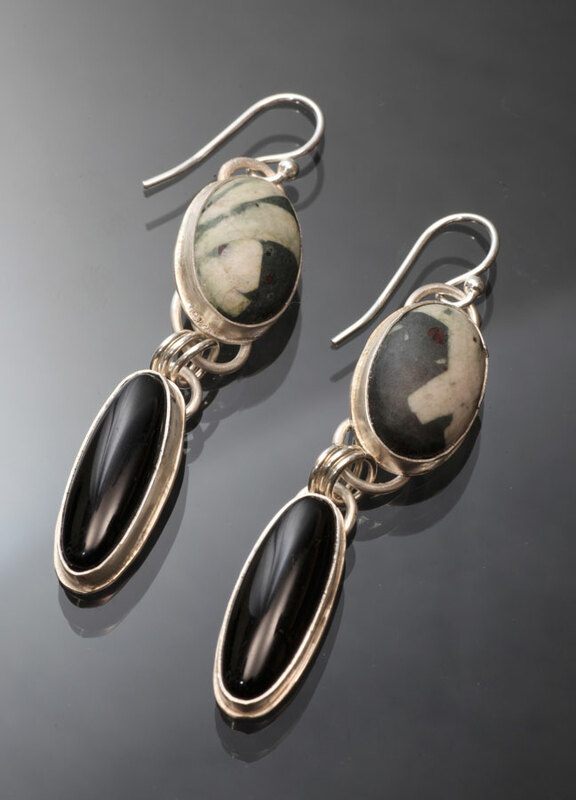 I set them aside and in another box of my stones, I saw these elongated Onyx stones, which came from Rogue Gems. As luck would have it, when I set those aside it was right underneath the Chinese Writing stones and I saw these earrings. I knew everything had to be kept simple and clean. The beauty of these two stones families, combined like this, was all the earrings needed. I have titled them Pathways. They showed me the path to take in my creative process to make them. My hope is they will inspire their future wearer to follow their life paths as they are encountered. The day I was pulling stones from my inventory proved to be a day of great pairings, just as the Pathway earring stones (pictured above) were. It truly did feel like I was being guided to put certain colors and stone types together. In this pendant, New Heights, I have a deep green spider vein turquoise paired with the pastels of a Willow Creek Jasper. In the Willow Creek stone, I see another mountain in the distance. It made me think of Mt Kilimanjaro and that symbolized new heights for me. Again, I felt a strong need to keep things simple. The cross shaped top piece is one I have used in another pendant. As I revisit the Soul Searching series, I want to explore the use of the cross with single and multiple pairings of stones and metal. 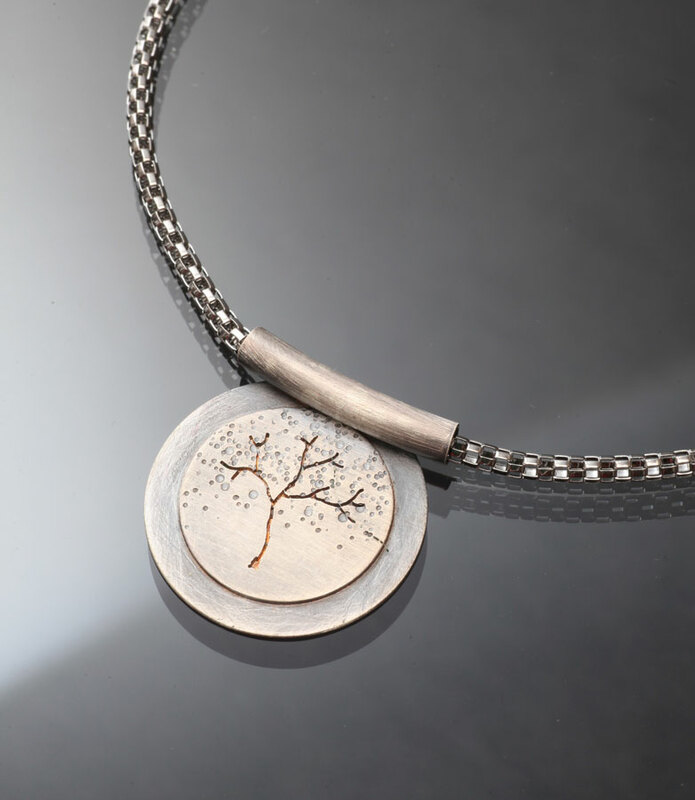 I will end with this pendant from Treescapes. Once again, I think it was the two stones that found each other as I was going through my inventory. Dendrites in limestone, tree perfection. The bottom stone is a lovely, rich russet red Morrisonite that pretty much begged to be paired with the dendritic top stone. I’ve been asked if it is hard to part with certain works. This one will be hard for me to let go to its future home. Yet, if it calls to the right person, as it called to me, so be it. A special thanks to my husband Dan for all the great photos he took of my latest works for this blog post. I would also like to express my appreciation to all of you who read my blog, who have come to visit me during Art Hop this past summer, stopped by my studio on the Front Range Open Studios weekend and purchased my work. I have enjoyed visiting with all of you. If you live in the area, I hope you will come to the trunk show on November 30th, discuss my work with me and find that right gift for this holiday season. It’s that time of year again! Monument, CO 2013 Art Hop season begins this Thursday, May 16, 2013. The official time for Art Hop is 5 – 8:00 PM. In Monument, Art Hop is on the third Thursday of the month, starting in May and running through September. There are so many cool things about Art Hop. Visiting the local merchants, seeing what’s new, meeting with artists at different locations where their works are represented, food, drink, good conversations, running in to friends and catching up. It’s just a very nice community event to socialize and enjoy an evening out. 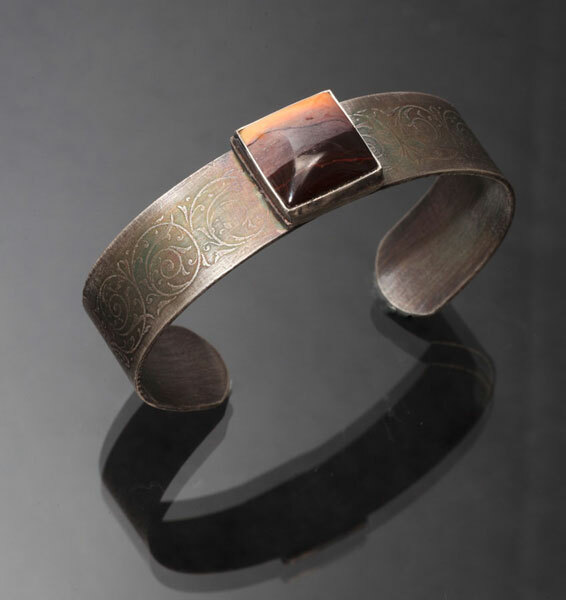 This year, I will be at Marylee Resig’s Santa Fe Trail Jewelry with my good friend and fellow artist Nancy Bonig. Marylee carries Nancy’s work and mine. Not only will Nancy & I discuss our respective work, but we look forward to talking about this year’s Front Range Open Studio Tours. There will be new artists joining us this year, like my friends Ginny & Frank Mailo of Monument Moon Studios. I’m excited about the prospects of expanding our network of friends on the tour, along with demonstrating some of the techniques we use in creating our artwork. I will have some of my new works, such as Express Yourself (with a little touch of Colorado), in addition to some of my latest Treescapes and Ginkgo leaf works. Nancy always has the most beautiful glass works, so I can’t wait to see what she may bring! Right now the weather forecast is GREAT for this Thursday evening, so why not make plans to have a wonderful evening out and just enjoy the atmosphere in Monument? Being able to express my individuality has been very important to me ever since I came of age in high school. For some it was the best time of their lives, for others it was a trying time and for people like me it was the start of a very personal journey of self-discovery. I started to learn the importance of being an individual. Being a lemming and following the crowd wasn’t something I sought. What I learned to embrace was being the person I was meant to be. At that time, I expressed myself with the clothes I made. Unique. No one else had anything like something I had made. Today, the same holds true for people who express themselves with their sense of style. A favorite pair of shoes. That eclectic blouse or dress that says I have the confidence to wear something this classic. So it holds true for those who wear art jewelry. It makes a statement, sometimes bold, sometimes subtle, about the individual who wears it. 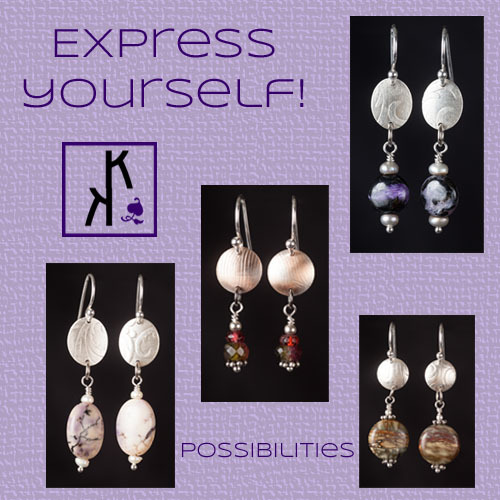 It is my hope that my new series of Express Yourself, with a little touch of Colorado, will provide the wearer that statement of individual style, grace and poise. The series is currently available at Santa Fe Trail Jewelry in Monument CO.
Another pair of earrings from my new Express Yourself series. 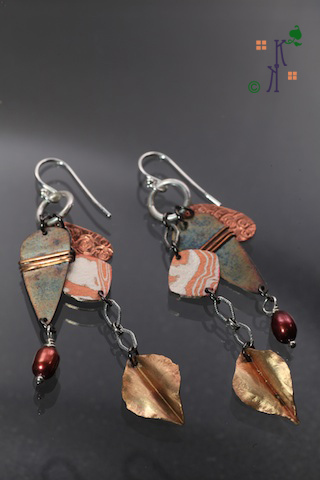 These are available at Santa Fe Trail Jewelry in Monument, CO. Sterling silver, a variety of pearls, Mokume-Gane, 14Kt Gold filled wire, brass and of course, the signature Aspen leaves. From my perspective, working on these earrings gives me the joy of creativity. I find it to be completely freeing; allowing me to be very artistic. From that comes such uniqueness for the person who wears them, allowing for a true sense of expressing who they are as an individual. I’ve always been one to shy from following the crowd, looking for ways to be me. Now I think these earrings can help others make statements about their self-worth and individuality. With the current forecast of snow and colder temperatures, fitting for those of us who enjoy the beauty of living in Colorado, I know I will be spending some quality time at my bench this weekend, working on more Express Yourself items. 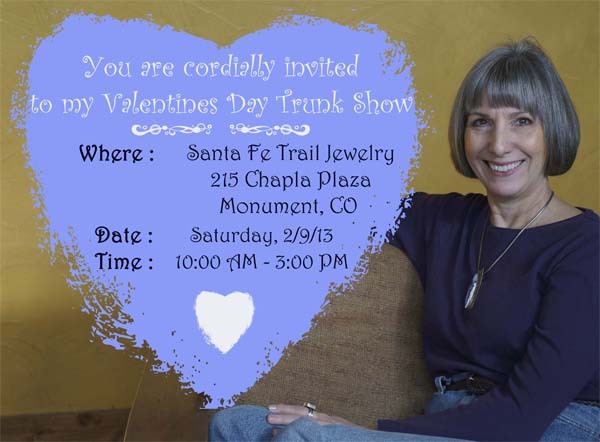 I am delighted that Marylee Reisig, owner of Santa Fe Trail Jewelry, asked me to do another trunk show for her. This time it will be in anticipation of Valentine’s Day and my hope is you will find something truly unique for that special someone in your life. In addition to my work, Marylee carries a wonderful variety of artwork and I think you are bound to find something you just can’t live without. Click here for directions to her gallery. Over the past number of weeks I have been working on new Treescape pendants and earrings which I will preview at the trunk show. I even have a few surprises in store in my Just for Fun line of jewelry. Marylee is going to have a sneak preview of a few items on Friday, 2/8, in case you want to get a head start on your Valentine’s Day shopping. I am so grateful to share a wonderful working relationship with someone like Marylee. There’s great energy at Santa Fe Trail Jewelry and I hope you can stop by, enjoy some beautiful artwork and talk about my creative explorations. 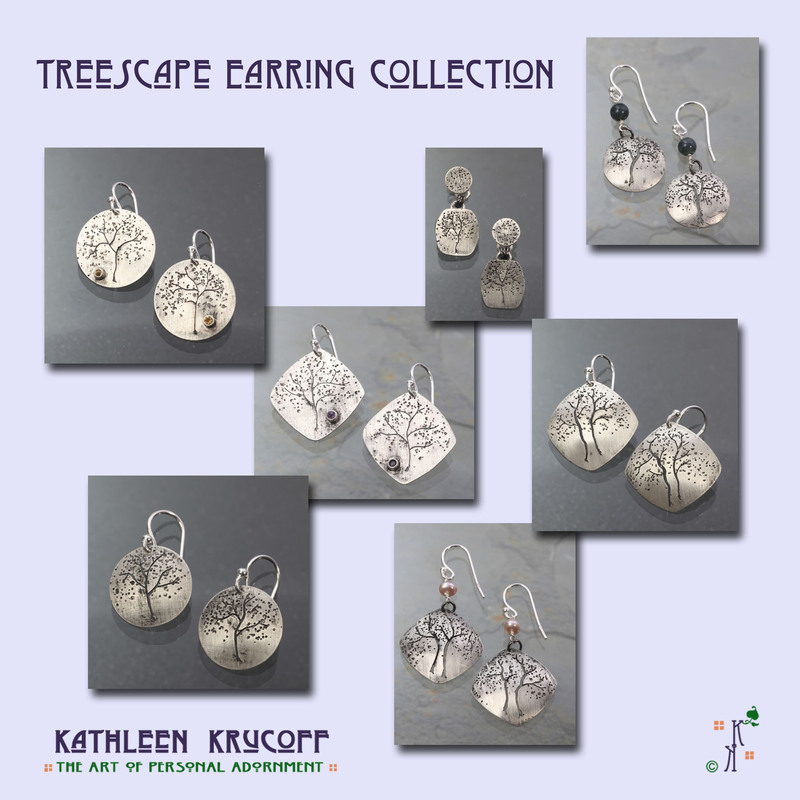 I am happy to introduce my Treescape Earring Collection. This is just a small sampling of the assortment I have available. They debuted in my studio during the Front Range Open Studio Tour. Since then, I have expanded on the styles, adding pearls, jaspers, and faceted stones such as amethyst, citrine and sapphires. This coming Saturday, Novermber 24th, is Small Business Saturday. 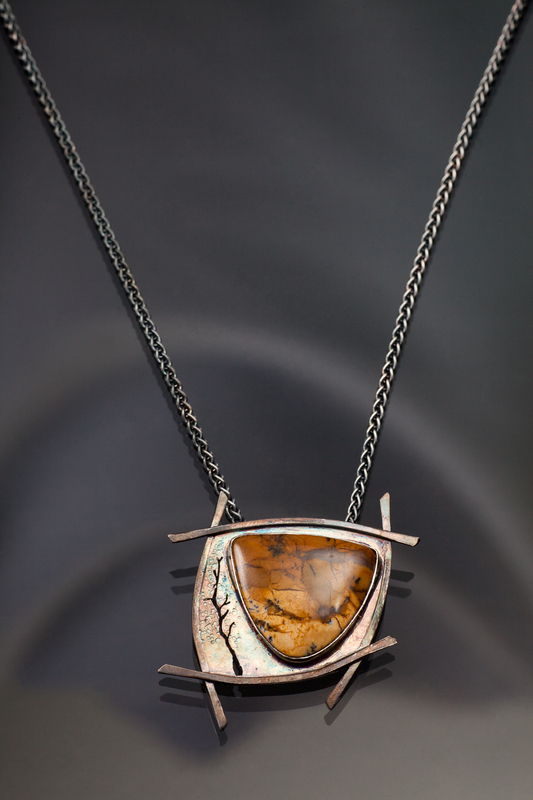 I will be doing a Trunk Show at Santa Fe Trail Jewelry in Monument CO from 10:00 AM to 3:00 PM. 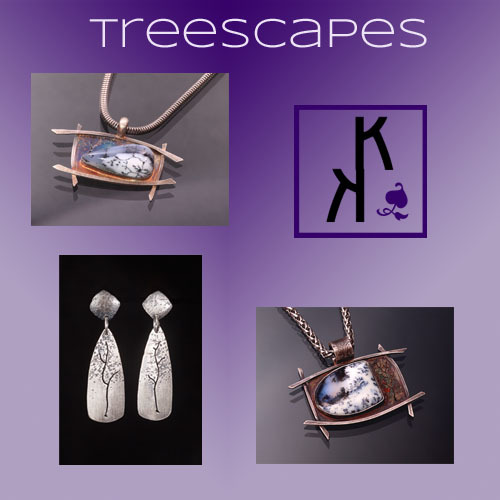 If you live in the area, I invite you to come to Santa Fe Trail Jewelry, visit with me, see my new Treescape Earring Collection along with some of the other wonderful items Marylee Reisig has at her gallery. 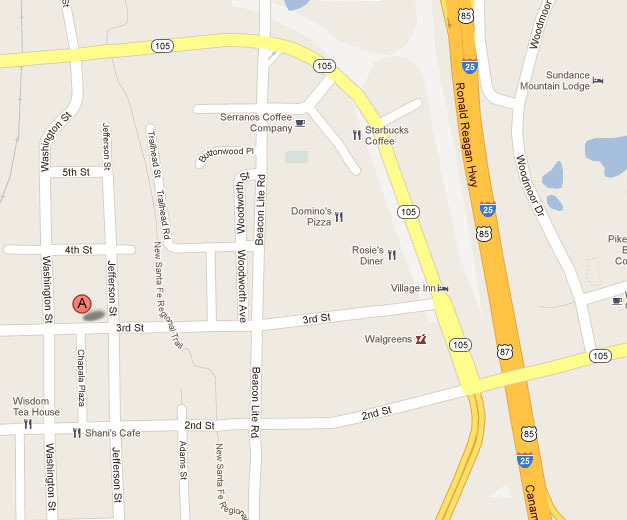 It’s a quaint and warm setting nestled in downtown Monument (see map below) located at 215 Chapala Plaza. As an added bonus you can enjoy Monument’s small town Christmas event with other merchants in the town. 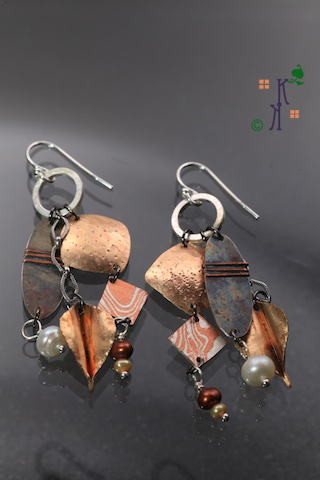 In addition to my new Treescape earrings, I will have more new works and hopefully you will find the perfect handcrafted gift for a loved one or friend. Enjoy the start of the Holiday festivities in the Art District of Monument, CO.
My heartfelt gratitude to Marylee for giving me the opportunity to present my new works at this Trunk Show. I look forward to seeing you.